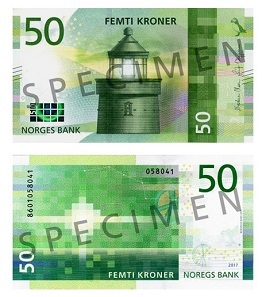 December 6, 2018 – The Norges Bank officially released their new 50 and 500 Kroner banknotes on the 18th October 2018, which comprises part of the Bank’s eighth series of banknotes first launched in May 2017 with the issue of the 100 and 200 Kroner denominations. The new series is a departure from earlier designs as the new series has chosen to depict scenes of Norwegian seafaring culture rather than historic or well-known personalities. The new 50 Kroner banknote features the Utvaer fyr lighthouse. Photo: Norges Bank. The 50 Kroner note is predominantly green and measures 126 / 70 mm. and includes the year “2017” seen on the back or reverse side near the watermark field. The theme of this note is “The Sea That Binds Us Together” and as such, featured on the obverse or front side of the new 50 Kroner note is the Utvaer fyr lighthouse located in Solund municipality. This structure was built in 1900 and is the westernmost point in the country. A 31 meter high cast iron tower, at the top of the lantern is a lens of the most powerful type that existed at the time. In order for the entire lens device to rotate, it rested several tons of heavy construction of glass prisms, brass and cast iron. These structures are of paramount importance in Norway, the first time which a specific Norwegian maritime landmark is mentioned in the country’s history was when Floke Vilgerdson in 869 AD built a structure known later as Ryvarden which is in Sveio municipality. The Service at Utvaer was an inherited service from father to son for several generations, as was the tradition along the coast. From the latter half of the 1800’s, many large towns were built along the Norwegian coast and today, many of these lighthouses remain well visible and dear landmarks to these communities. The reverse side includes an abstract design which depicts the shine of a light signal from a far away. The weather conditions make visibility difficult as is often the situation from far away from the coast and this is symbolised with short rectangular shapes and slake waves in the organic pattern. Also included in the design is a clear image of the Karlsvogna constellation and a mark that shows the sector division for the lighthouse on the chart. The 500 Kroner note depicts the life boat RS 14 “Stavanger”. Photo: Norges Bank. 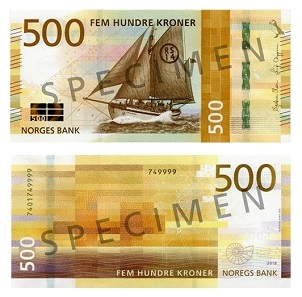 The 500 Kroner note is predominantly brown and measures 147 / 70 mm. and includes the year “2018” seen on the back or reverse side near the watermark field. The theme of this note is “The sea that gives us prosperity” and as such, featured on the obverse of front side is the rescue or life boat RS 14 “Stavanger” which was designed by Norway’s most famous boat builder and designer Colin Archer. The boat was built at Archer’s shipyard in Larvik and launched in 1901 and had 37 years of active service for the Rescue Company. The main motif on the note is based on an original photo of the rescue company taken by Robby Madsen. The sea has immense natural resources, but also strong forces. Weather and their harsh conditions are part of life when you want to reap the riches of the sea. Access to help when needed most depends on many lives, and gives us increased safety when we travel on the sea for work and leisure. Today, the Rescue Company operates operations from dozens of stations spread throughout the country with more than 40 lifeboats available which are on standby 24 hours a day, all year round, around the coast. The reverse design includes an abstract image which one can faintly see the outline of an oil platform on the horizon. The design also includes the depiction of a gas pipeline network from the North Sea. The gas pipeline system is a stylised rendering of white lines forming parts of the transport system for gas from Norway to abroad. The design element is based on information from Gassco’s website per posted from August 2016. A fossil / ammonia linear image is also seen positioned toward the lower right corner. “Floating ring” hologram effect – In the bottom-left corner of the notes is a display of rectangles collectively containing a ring. When the banknote is tilted in different directions the ring appears to float which also displays a play of colours. The denomination is also shown in numerals as part of the printed element of the rectangles. Security thread – When the banknote is held up to the light, the security thread is visible as a dark line running through the paper. The thread also contains see-thru micro-text which includes the numeric denomination of the banknote. Iridescent effect – Seen on the back of the banknote at an angle, is a two-coloured design element printed with an iridescent effect. The element can also be found in the lower-right corner of the banknote, printed in the denomination’s main colour. “Anchor chain” live feature – To the right of the note is a live feature effect in the shape of an anchor chain that is integrated in the paper. When the note is tilted, the chain appears to move. The anchor chain is found on all denominations except for the 50-krone note. Watermark – When the banknote is held up to the light, the watermark, the head of an Atlantic puffin with the denomination, is visible. The Atlantic puffin motif is featured on all the denominations. The choice fell on the puffin to use in this security feature, which is a famous seabird with a very distinctive appearance. At the top right of all notes in the new series – left corner on the front, right corner on the back, is the image of a puffin bird. The updated 100 Kroner banknote was issued in 2017. Photo: Norges Bank. 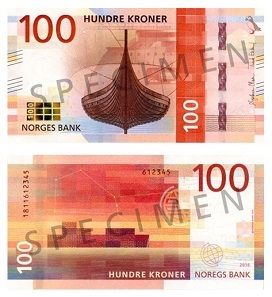 The primary motif on the front of the 100-krone note is the Gokstad ship which is Norway’s largest preserved Viking ship. The ship was built around 900 AD and was found in a burial mound in 1880. In the background is a vague Norwegian bow design X-BOW, which is a bow concept developed by the Sunnmore-based company Ulstein Design & Solutions AS. Their bow design is inverted abaft or nearer the stern so that the ship is longest at the waterline. In principle, a hull constructed with this design will have greater displacement volume starting from the waterline than conventional hulls. The reverse side includes an abstract design which depicts the vague image of a cargo ship on the horizon. A gentle breeze is symbolised by rectangular forms that are slightly longer than those on the 50 kroner note where the waves in the organic pattern begin to crest. A globe and parts of the constellation Orion are also visible. 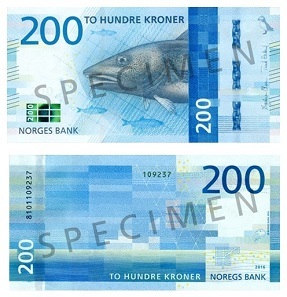 The updated 200 Kroner banknote is dedicated to Norwegian sea life. Photo: Norges Bank. The primary motif on the front side of the 200-krone note is the image of a codfish. Herring and the mesh from a fishing net can be seen in the background. For centuries, fishing has been a key source of income and important part of the culture along the Norwegian coastline. It is believed that the search for rich fishing waters is what brought the very first settlers to the Norwegian coast nearly 11,000 years ago. As early as the Middle Ages, what started as fishing for personal consumption and regional trade became a substantial export industry. Norwegian dried cod became an important contributor to European diets with herring, roe and cod-liver oil also being widely exported. The reverse side includes an abstract design of a simple fishing boat which is vaguely depicted or shown on the horizon. A gentle sea-breeze is symbolised by the rectangular forms which are slightly longer than those seen on the 100 kroner note and where moderately high waves form in the organic pattern. There is also a series of lines that form the image of a fishing net and a sea mark or day-marks that aid seafarers navigate during daylight hours can also be seen. The Norges Bank’s own corporate designers, Arild Yttri and Morten Johansen have designed the new banknotes. The designs transitioned from proposals submitted by Metric Design and Terje Tonnessen (front) and Snohetta Design (back) which also included the addition of security and safety features. Norges Bank will complete the issuance of the five denomination banknote series with the release of the 1000 kroner note, which is expected in the fourth quarter of 2019. For additional information on these and other banknotes issued by the Norges Bank, please visit their website. A music video released by the Norges Bank explaining the imagery and security features of the 200 Kroner banknote became a viral hit in Norway.